The massive black hole in M33 X-7 is hidden in the X-ray bright center of the pancake-like accretion disk of matter. The black-hole's hot (blue) and massive star companion is losing mass in a wind that gets pulled and captured by the black hole. A massiveblack hole that is spewing X-rays and locked in a tight orbital dance around ahuge, dim star finally has a good origins story. Unlike binaryset-ups that result when a giant star absorbs mass from a companion star thathas nearly exhausted its nuclear fuel, the huge black hole M33 X-7 could haveformed because, in this case, the companion still had plenty of hydrogen toburn, according to a new study. The enormousstellar black hole ?has 15.7 times the mass of the sun and is orbiting aneven larger star ? which is 70 times the sun's mass ? once every 3.45 days. OtherX-ray binaries typically have stellar black holes of 10 solar masses. The pair islocated about 2.7 million light-years from Earth in the galaxy Messier 33. Researchershad been hard-pressed to come up with a satisfying explanation for M33 X-7using existing models of binary X-ray systems. As a furtherwrinkle, the companion star is much dimmer than usual for its mass. In one modelproposed to explain M33 X-7, after the primary star begins to run out ofhydrogen fuel and expand, its outer region forms an envelope that encompassedboth it and its companion. But for astar big enough to generate a nearly 16 solar mass black hole, as in this case,the envelope would have led to the merger of the two stars. While some otherproposed models can account for the masses and tight orbit of the system, theydon't solve the mystery of the blackhole's X-ray glow and spin. The relative dimness of the black hole's starcompanion and their elliptical orbit also were unexplained. Valsecchi andher colleagues came up with a different possible history for the pair. In theirmodel, the black hole-star pairing stems from a giant star ? the future blackhole ? nearly 100 times the mass of our sun, ?circling a second star of about30 solar masses every three days or so. In such a tightorbit, the future black hole is able to start transferring mass while it isstill burning hydrogen into helium. As a result, it loses most of its hydrogenenvelope (becoming a so-called Wolf-Rayet star) and sheds the rest of the ?envelopein the form of stellar wind, exposing its helium core. Its companiongrows far more massive in the process, becoming the larger and more massive ofthe two stars. But it remains dim because the added mass doesn't dramaticallychange the rate of nuclear reactions in its core, researchers said. 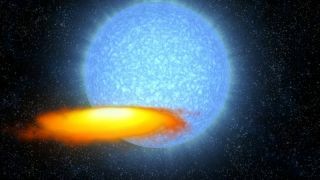 Finally theprogenitor star collapses under its own gravity, yielding a black hole, andbegins absorbing stellar wind from its companion, leading to powerful X-rayemission. Energy released during the gravitational collapse imparts a kick tothe black hole that leads to an elliptical orbit, and the black hole's spinresults from the spin of the star itself. "It isencouraging to have confirmation of our basic understanding of binary evolutionand black hole formation," Valsecchi said, "as it allows us to trustour physical models and make predictions for other black hole systems that areyet to be discovered." According tothe researchers, existing Wolf-Rayet binaries containing massive companionstars may represent the early stages of process that led to M33 X-7, providingfurther evidence for the model. Valsecchisaid she and her colleagues are currently investigating the history of another X-raybinary system that contains the mostmassive black hole to have formed around another star.